The Nile River, the longest in the world at 4,258 miles (6,853km), is shrinking in the face of several harsh environmental challenges. An exploding human population and continued exploitation of communities and natural resources along the river has put unprecedented strain on the Nile, threatening ecosystems and the long-term economic prospects of the region as competition over dwindling resources escalates. Meanwhile, climate change and its effects on weather patterns, including rain, has changed the shape and size of the Nile and is expected to continue to reduce the river’s flow. Finally, the desert encroaches ever further into the once-fertile Nile ecosystems and pollution poisons the water that remains. Over 80 percent of the Nile’s source waters have historically come from massive rains in Ethiopia. However, these rains are no longer occurring as frequently or consistently, which has made planning more difficult. “It’s so inconsistent now. Sometimes stronger, sometimes lighter, but always different,” said Lakemariam Yohannes Worku, a lecturer and climate researcher at Arba Minch University. When it rains too little, crops suffer and so does the river. When it rains too much, the intense storm washes away top soil and clogs dams with sediments. Even under normal precipitation circumstances, the Grand Ethiopian Renaissance Dam, over a mile across, would pose significant challenges. While it may serve the needs of Ethiopia, it threatens to cut off countries further down river from the sustaining waters of the Nile. 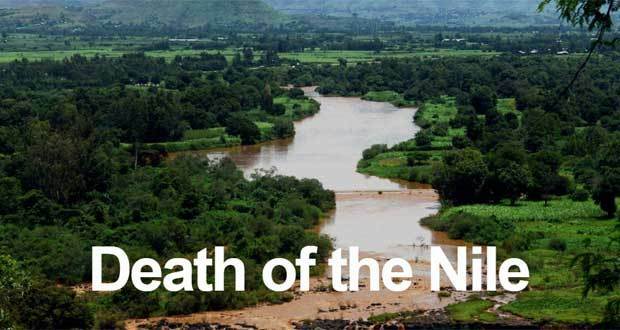 The entire population of the Nile River basin is expected to double by 2050. This follows a period of huge growth, in which Egypt’s population quadrupled since 1960. “We’ve always treated the river badly, we’ve always assumed it was big enough,” said Youssef Abugroun, an engineer and part-time fisherman. “But maybe we’re just too many for that now.” Fishermen, many of whom are from families that have made a living from the Nile for generations, are suffering major losses and are struggling to make ends meet. Toxic run-off and other pollution from the rapid urbanization without necessary clean-up infrastructure also contributes to the river’s sickness.